The Gatsby Jazz Band for hire for 1920s to 1930s Jazz & Swing - perfect for parties, weddings, corporate functions and other events across the UK - jazz band and swing band hire based in Bristol, Bath, Gloucestershire, Wiltshire, Oxfordshire, Berkshire, Somerset, Hampshire & South Wales..
- the music brings a smile to the face and gets those dancing feet dancing. The Gatsby Jazz Band for hire for 1920s to 1930s Jazz and Swing - perfect for parties, weddings, corporate functions and other events across the UK - jazz band and swing band hire based in Bath. The Gatsby Jazz Band for hire for 1920s to 1930s Jazz and Swing - perfect for parties, weddings, corporate functions and other events across the UK - jazz band and swing band hire based in Gloucestershire. The Gatsby Jazz Band for hire for 1920s to 1930s Jazz and Swing - perfect for parties, weddings, corporate functions and other events across the UK - jazz band and swing band hire based in Somerset. 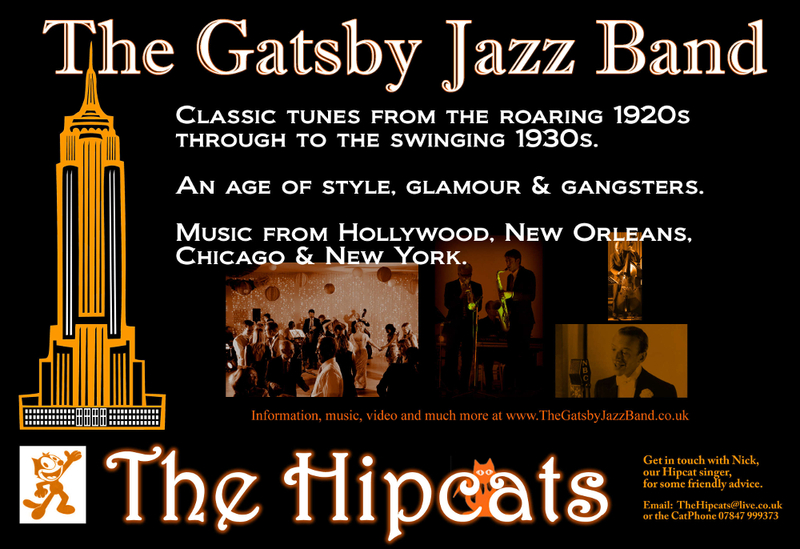 The Gatsby Jazz Band for hire for 1920s to 1930s Jazz and Swing - perfect for parties, weddings, corporate functions and other events across the UK - jazz band and swing band hire based in Oxford & Oxfordshire. The Gatsby Jazz Band for hire for 1920s to 1930s Jazz and Swing - perfect for parties, weddings, corporate functions and other events across the UK - jazz band and swing band hire based in Berkshire. The Gatsby Jazz Band for hire for 1920s to 1930s Jazz and Swing - perfect for parties, weddings, corporate functions and other events across the UK - jazz band and swing band hire based in South Wales.